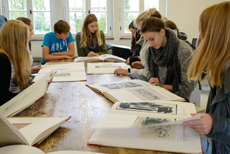 In the course of the project “History of Nazi Germany, Institutions, Human Rights” at the Neuengamme Concentration Camp Memorial, educational materials were developed that discuss the role of the police, the judiciary, public administration and the armed forces in Nazi Germany as well as current human rights issues. These materials aim to bring together approaches from both historical/civic and human rights education in discussions about the role of state institutions in the past and the present. Under the header The Project, you can find further information on the project’s background, the issues it deals with, wits aims and the people and institutions involved. Information on the content and format of the different seminars and further training courses that were developed in the course of the project can be found under Education. The header Course modules offers an overview of the different subjects that can be discussed in the project seminars. An introduction to the project handbook for staff members of memorials and other disseminators from the education sector can be found under Publication. If you wish to book one of our seminars, please click on Contact and information. 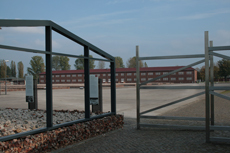 The main entrance to the Neuengamme Memorial, November 2010.